Today, a doctor at the Artisan Dentistry can replace a full jaw with dental implants and a fixed bridge that results in a permanent, stable and highly esthetic solution. 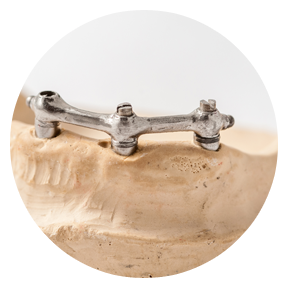 Dental implants, fused to the jawbone, keep the bone healthy and your teeth securely in place. Once dental implants have been placed in your jaw, they can be restored with a fixed bridge or with an over dentures. A fixed bridge is permanently secured to the dental implants, while removable over dentures are held in place by a bar and clip or by one of many other attachments currently available. Find out why patients from all over New England come to the Artisan Dentistry for their dental implants. Contact our office today to schedule a consultation with Dr. Paul Mathew.